The most important deadline that we have faced so far is at midnight on Sunday, but I am not going to ask you for any money. I just want to say thank you to everyone that has donated, volunteered and prayed over the past six months. Without all of your efforts, it would have been impossible for us to be within striking distance of victory here in Idaho’s first congressional district with just a little more than four months to go until election day. When I first announced that I would be running, many people told me that it would be impossible for a political outsider to win in this district, but we are proving the naysayers wrong. We are so far ahead of where we thought that we would be at this point, and our opponents are literally freaking outover how well we are doing. As the December 31st deadline approaches, my opponents have been sending out email after email in a desperate scramble for money. The reason why I know this is true is because we are on all of their email lists. But I have decided that we are not going to do the same thing. Yes, we need support just as badly as they do, but I am simply going to trust the Lord that the resources will come in. We have already told our supporters what our needs are, and we are going to trust that the Lord will move in the hearts of those that are supposed to give. The stakes in this race are exceedingly high. As we look at the numbers, it appears likely that one particular opponent is likely to emerge victorious if I do not win next May. If he wins, it will be a complete and utter disaster for the Trump movement. 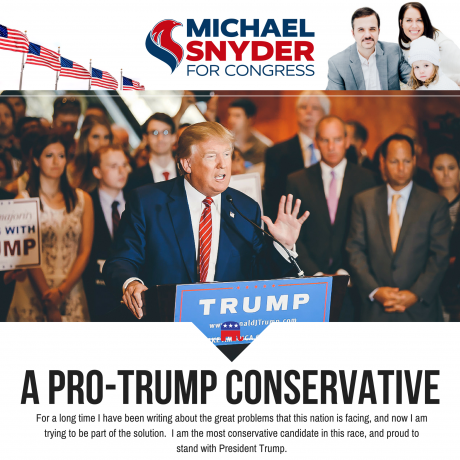 This particular opponent fought to keep Donald Trump out of the White House, his campaign has repeatedly attacked my faith, and by lying over and over again he has demonstrated that he simply does not have the moral character to serve in Congress. This post was published at The Economic Collapse Blog on December 30th, 2017.